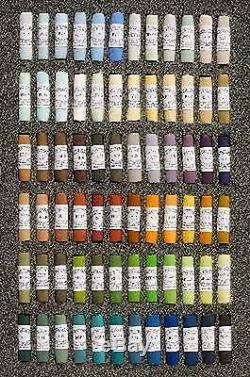 PRODUCT : UNISON ARTISTS PASTEL SET - 72 LANDSCAPE. DESCRIPTION : Unison Soft Pastels are second to none in the subtlety and intensity of colour, their fluency and responsiveness to touch, and in their delicacy and robustness. Unison Colour hand-made pastels aspire to perfection. These colours have stood the test of time and are very durable and light-fast. This set of Pastels is securely packaged in a heavy cardboard box with protective foam inserts. A 54, BV 13, BV 8, BV 14, BV 9, BV 10, Grey 18, Grey 6, Grey 17, Grey 5, A 19, A 25, BG 18, BG 12, BG 6, Grey 28, Grey 29, Grey 25, Y 18, Y 17, YGE 13, BE 13, BE 14, BE 33, BE 28, BE 29, BE 5, BE 6, A 37, A 38, A 26, A 33, A 34, A 35, A 29, A 30, BE 15, BE 16, BE 17, RE 17, RE 12, RE 11, L 43, Y 13, Y 14, Y 16, Y 1, YGE 12, BE 34, BE 35, BE 36, GRN 15, YGE 18, GRN 14, GRN 32, GRN 26, GRN 10, GRN 11, GRN 17, GRN 18, A 43, A 44, A 45, BGE 5, BGE 10, BGE 11, A 51, BV 17, BV 18, A 50, A 49, Grey 13. The item "Unison Artists Pastel Box Set 72 Landscape Colours" is in sale since Tuesday, December 28, 2010. This item is in the category "Crafts\Art Supplies\Drawing & Lettering Supplies\Art Pastels". The seller is "bargainartistshop" and is located in Stafford, Staffordshire. This item can be shipped worldwide.